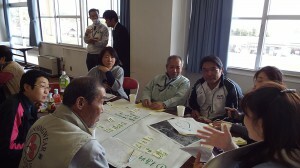 A Workshop for Planning “Kizuna[i]Park” (tentative name) was held on April 4, 2013. 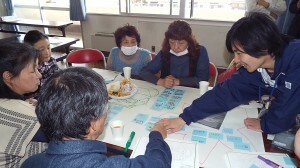 We are now planning to construct Kizuna Park within the temporary housing site in front of the Shichigahama Lifelong Learning Center (also known as the Central Community Center). It is scheduled for completion on July 15, 2013. Well, let me explain briefly. Q．Why has the Rescue Stock Yard (RSY) proposed the construction of the Kizuna Park? A．Children used to play in various places including parks, sports facilities, and beaches. Such locations, however, have significantly decreased due to the construction of temporary housing and other restoration works. Not only children but also mothers often tell us, “We want a park!” Our proposal comes from the awareness that some kind of playground is necessary. Q．What kind of a park will it be? A．Leaving the construction of usual parks with a lot of playground equipment to the town authority, we have planned a do-it-yourself project in which the residents and volunteers will work together to create the park. We will do whatever we can do ourselves, making the best use of the existing landscape and trees. We would like the park to fulfill the needs of mothers and children, providing a place where residents can enjoy nature, such as trees and plants, and where children can play safely. At the same time, the social withdrawal, especially of aged residents, from activities at the temporary housing is becoming one of our serious concerns. As a measure to address this problem, we would like to put benches in the park to encourage them to come out for a walk. The park will be a place where senior citizens can listen to the voices of children and have some communication with them. We envision a space where people can watch over each other with care. That’s why we decided to construct a park. If we are going to create a park, why not involve the residents? 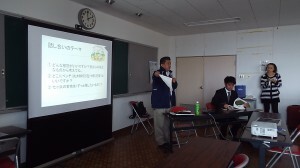 This thought led to the organization of the workshop. Many residents of all ages, including children, participated in the workshop, and made suggestions from diverse viewpoints. Thanks to the pleasant weather, nearly 40 residents joined the discussion. 1. What shall we plant in the park to make it feel like a real kizuna? 2. Where shall we place the benches (9 tree stumps)? 3. 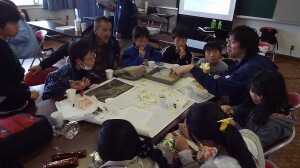 What are the treasures of Shichigahama (which you would like to preserve)? Some children also made “out-of-the-flower-box” suggestions, such as broccoli, carrots, parsley, and butterbur sprout. It seems that they want something like a home garden, thinking that growing and harvesting their own vegetables will be fun. What a flexible mindset! How interesting! Since this project was inspired by the voices of local people, we would like to keep listening to those voices to make a comfortable park for everybody. We will continue to post progress reports of this project through our blog. Stay tuned to find out how the park will evolve! Come and join us! Kizuna Park will be your park! [i] Kizuna is a Japanese word which means bond between people or sense of being connected.